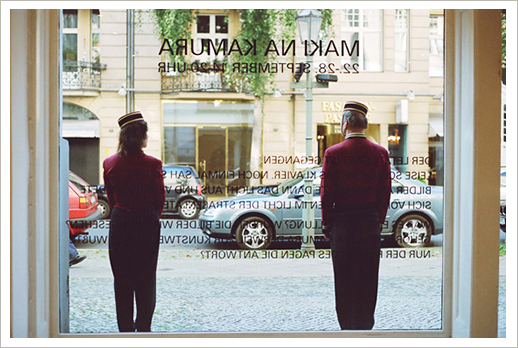 Aichi University of Fine Arts and Music and Kunstakademie Düsseldorf, the Japanese-born artist MAKI NA KAMURA moved to Berlin. In 2005, she exhibited a number of works herself. Rather than sending invitation cards or posting details online, the show was announced only via a large advertisement in a Berlin daily newspaper: “IHR SCHÖNSTES BILD HAT SIE VERKAUFT UND IN EINE ANZEIGE VERWANDELT. NUN SPIELT SIE LE COUCOU AUF DEM PIANO…” (She’s sold her best picture and turned it into an advertisement. Now she’ll play “Le Coucou” on the piano …). A grand piano was acquired, on which Na Kamura practised every day in front of her pictures and, as announced, pondered questions like: Is this an exhibition? Or: Am I now part of the art world? 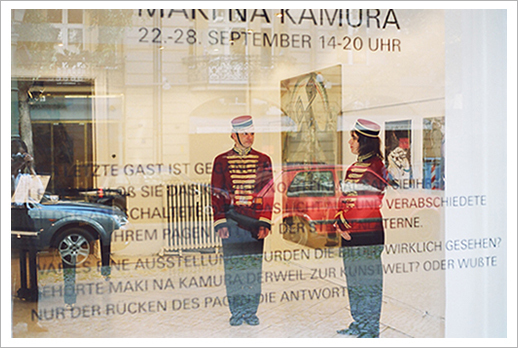 This one-week event, referred to in one piece on her show as “Na Kamura’s first discrete entrance into the arena of the Berlin art world“, took place in an empty shop at Fasanenstrasse 69.
by the exhibition FOLGEAUFTRITT (Follow-Up Performance) in Berlin-Mitte. Once again, no invitation cards were printed for the opening. Instead, a poster was hung in every station of Berlin’s S-Bahn train network, informing an audience beyond the art system. In her first show outside Germany, at Prague’s Svestka Gallery in 2008 under the title “le désespoir du peintre” (Painter’s Despair, the French name for the flowering plant known in English as baby’s breath), Na Kamura blocked the door to one of the five rooms with a sign: “Today No Entry”. Inside, she installed a table vitrine containing source materials, sketches, narratives and autobiographical material. Such deliberate withholding of all too obvious information is also characteristic of her painting, which can be classified as neither Minimalist nor Informel. paintings are clearly rooted in the 21st century, they do not indulge the global fantasies of the age, making use of them instead. In her pictures, one can find constructions from classical pictorial spaces, nonconformist use of oriental-Asian sources including Hokusai, as well as links to the landscapes of Caspar David Friedrich and Jean-François Millet.